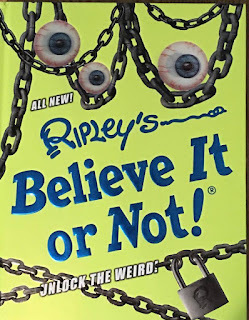 We had the opportunity to review the new Ripley's Believe It or Not-Unlock The Weird from Ripley Publishing. I couldn't wait to get my hands on this book. Ever since I was young I have been a big fan of Ripley's Believe It or Not and their shocking museums and mind blowing attractions. I just knew this book would not fail to fascinate me. Ripley's Believe It or Not - Unlock the Weird is a large hardcover book. The art work on the neon green cover of the book is even amazing.This book is a collection of mind blowing stories from all over the world. Ripley's has hand picked the best. Some may leave you scratching your head but every story and fact is 100% true! From exciting, fun and creepy, there will be something for everyone. The sections in the book include pop culture, food, feats, arts, animals and beyond belief. Some of my favorite parts of the book is in the beyond belief section. Ted Richards who had his ears removed and his face and eyeballs tattooed to look like his pet parrot. Read about one man who attempted to take a break from reality by spending three days climbing the Swiss Alps on all fours as a goat! If you add up all the time that a persons heart rests between beats, you would find that it doesn't beat for about 12 years out of an average lifetime. These and so many more fascinating stories and facts. There are 245 pages of brightly colored crisp pages. You will come across some hair raising pictures that definitely unlocks the weird. My whole family gets into these books. 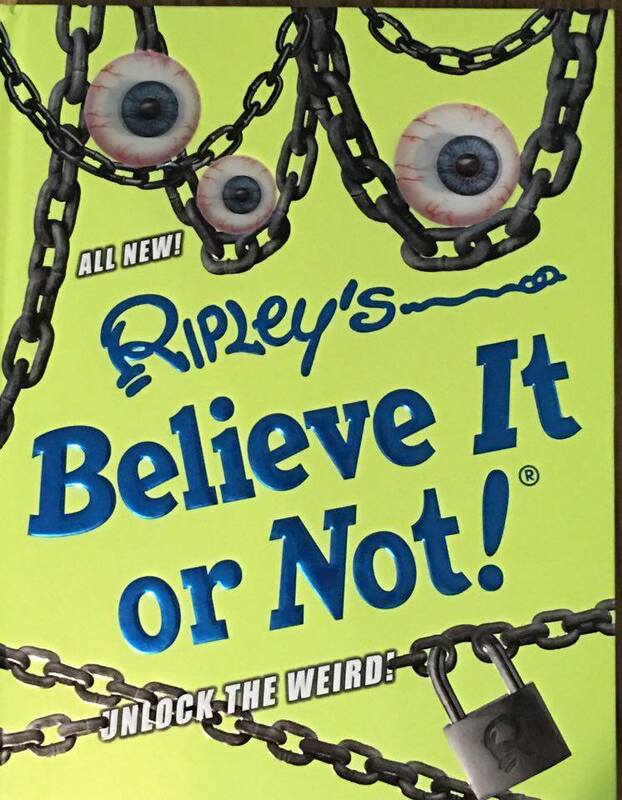 My teen boys, unfortunately are not hip about reading but they will read the Ripley's Believe It or Not books from the first page to the last. I recommend this book to everyone.You will find yourself intrigued and astounded with each story. Ripley's Believe It or Not, they are the authority of all things unusual and incredible! You can connect with Ripley's via Facebook , @Ripleys , Instagram , You Tube and Their Website . We love this book, get one every year! This is a great gift idea for my son! He loves trivia and weird facts about pretty much anything so I know this would be a huge hit.Adding it to the list!